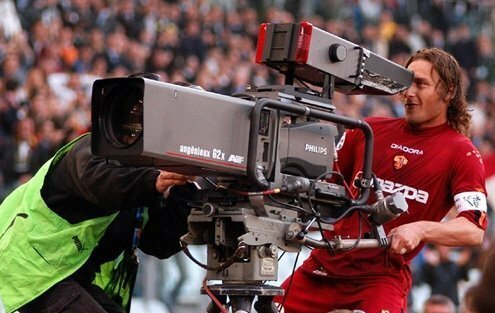 In 2007, Totti famously positioned himself behind a TV camera after scoring a goal. otti. Roma. The two reflect each other. Nowhere else in major European football are the identities of a player and a club so tightly interwoven if not indistinguishable. Alongside the “one club men” of his generation — a list that includes Paolo Maldini (Milan), Alex Del Piero (Juventus), and Xavier Zanetti (Inter) — Francesco Totti, who will turn 40 in September, ticks all the favorite son boxes and then some. Born in Rome, he has been the most influential player at his hometown club since the early 1990s. With 247 goals, he is the second highest scorer in Serie A history, and first among those who played after 1960. Yet the eternal captain’s legend is just as much about what he didn’t achieve. Unlike his one-club peers, whose affiliation with big-spending Milan, Juve and Inter helped them win countless domestic and European trophies, Totti resisted the temptation to move to a bigger stage with bigger rewards. Even when teaming with Argentine Gabriel Batistuta to win the 2001 scudetto, or shield — the only league title of the Totti era (and only the third in team history) — the championship carried Totti’s face. Batistuta was the scoring machine but Totti remained Roma’s unquestioned and ever-heroic protagonist. At Roma, the old saying that no one player is bigger than his club long ago withered away. Totti was and remains bigger. This Roma season has unfolded in much the same way as the previous two. The team will achieve a competent top three finish, ensuring participation in next year’s Champions League. But inconsistency left Roma far behind champions Juventus, which won its fifth straight title. The key difference this year has been the aging Totti’s receding impact. Injured for the entire first half of the season and in the final year of his contract, the captain clashed publicly with manager Luciano Spalletti over his lack of playing time, and with club owners over his future. Though most managers would have been praised for the substitution, if not the final score, Spalletti found himself under siege. As did Roma president James Pallotta, who as recently as March had openly questioned Totti’s playing future (“It’s obvious to him — I think — and to a lot of people that he can’t play the same way.”) Pallotta also suggested it might be time for Totti to enter management. Now, he is inviting him to sign a one-year contract extension. Tactically speaking, Spalletti’s Totti strategy was understandable. A few months shy of 40, Totti’s legs simply don’t possess more than 30 minutes of running time. By using him late in games, usually with less than 15 minutes left, he was trying to get the best of an aging, often injured but still highly motivated player. Also understandable was Spalletti’s urge to impose discipline at a club better known for its colorful personalities than its football professionalism. Spalletti managed Roma from 2005 to 2009, learning all about the Totti cult. When he returned to the Roma bench for his second spell, replacing increasingly unpopular Frenchman Rudi Garcia, he probably hoped for a clean slate to implement his methods. But the Totti situation soon took on dramatic proportions, and it now appears those dramatics will get another year to play out. In fairness to Totti, players of the stature of Maldini, Del Piero, and Zanetti were each able to dictate the terms if not the timing of their exits, even if they were no longer integral players on the field. While both Totti and Spalletti have been guilty of overstepping boundaries — Totti for publicly questioning his lack of playing time, and Spalletti for publicly calling out the professionalism of his captain — the real blame has been with the lack of forthrightness from management. Pallotta is seemingly on his way to remedying the situation, winning a reprieve from Totti’s rabid fans. The real truth is that Roma is Totti, warts and all. Even if he can only play in snippets, he has shown his enduring value as a super sub, scoring yet another super-sub goal in Roma’s 3-2 victory over Genoa on May 2. Perhaps at the end of next season he can finally go out in scripted style. Dino wrote "Divin Codino," the magazine's sports column from 2015 through 2016.